Heiress of a vast family fortune, Katharine Drexel did more than give alms to the poor. She dedicated her personal energies and all her wealth to building institutions that would change the shape of the society in which she lived. Born in Philadelphia two years before the outbreak of the Civil War, Katharine Drexel’s life spanned nearly a century; she lived to see the United States move from the brink of disintegration to become the most wealthy and powerful nation in the world. During this period, however, her work was to found a congregation of women religious -- the Sisters of the Blessed Sacrament -- specially dedicated to missionary activity among the poorest of America’s poor: the newly freed blacks and the increasingly oppressed indigenous peoples. Mother Drexel for many years traveled widely through the deep South and the Southwest, dedicating her administrative talents as well as her financial resources to furthering the work of her order. She was especially concerned with the founding of schools for Native Americans and African Americans (in 1917 she founded Xavier University in New Orleans, the first African American Catholic college). In the final twenty years of her long life, however, a heart condition forced the end of her journeying. 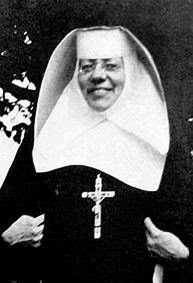 Yet her labor during this time of suffering and what appeared to the rest of the world to be “retirement” was the greatest of all her works: Saint Katharine Drexel dedicated her remaining years to daily adoration of Jesus in the Eucharist, surrendering to Him all of her missionary zeal and love for the poor.